Let?s begin this chapter with a story. Imagine there is a set of twins, both of whom are traders and who are identical in almost every way. They both have the same trading system, same entries, exits and money management rules. They both commence trading with exactly the same amount of money, using the same broker and receive the same buy signals. After two months of trading, you would expect each twin to end up with exactly the same amount of money. However, one twin has a 30% increase in her account while the other has a 10% decrease. So, what causes one trader to be a success and another to fail? The reason for this difference lies in their trading psychology. However similar they may be, it must be remembered that ultimately they are different people and therefore think differently. One twin may get too greedy or too fearful, cutting her winning trades short and letting her losses run, while the other twin has a firm commitment to stick to her strategy no matter what, and hence reaps more reward. How an individual thinks plays a huge part in the way she trades. What?s more, every person is different and so the way she approaches trading will also be different. The ?good? trader is someone who will respect her tried-and-tested rules, sticking by them no matter what. The ?bad? trader is someone who will let her emotions determine when she trades. This will result in inconsistent trading and ultimately failure. I don?t pretend to be the first person to say psychology is an important element in becoming a successful trader. In his book, Trade Your Way to Financial Freedom,? the renowned American psychologist Dr Van Tharp discusses the role that psychology plays in trading success. He divides trading into three ?ingredients of trading?:? trading system, money management and psychology. Using a pie chart to represent a successful trader, Tharp apportions each segment by importance: the bigger the segment, the more importance it has to someone wishing to become a successful trader. This pie chart is shown in figure 2.1. As you can see, the way in which she thinks ? her psychology ? plays more of a part in the make-up of a successful trader than the other components combined. Your psychology is unquestionably the most important factor you will need to address in your quest to become an awesome trader. There are many definitions of psychology. The BBC jargon guide defines it as, ?The science that deals with mental processes and behavior?. These mental processes include thoughts, feelings and motives. Emotions such as fear, greed, vanity, pride and hope affect all areas of our life ? especially trading. Two classic examples where a trader is controlled by her emotions, would be when she closes out a position either too early or too late. Holding on too long demonstrates what is referred to as ?loss aversion? ? the trader?s tendency to strongly prefer avoiding losses than acquiring gains. This is an emotional response hardwired into our genetic makeup. In application this means that when facing a losing position, and the price is going down, a trader will hold on because they don?t like the idea of losing. They?re holding on, hoping the price will turn around. Many times it never does. On the flip side, you could also say loss aversion causes traders to close out positions too early. When a trader sees a small profit, she is afraid of losing what she already has so she closes out the position too early. These emotional responses are in direct opposition to what a trader should be doing ? cutting her losses short and letting her profits run. These traders also engage in other forms of irrational behavior, like attributing success to skill and losses to bad luck. Worst of all, this is just the tip of the iceberg when talking about the other devastating effects of trading with your emotions. The truth of the matter is this: without controlling their emotions, most new traders lose all their money very quickly in the markets. In fact, most are completely wiped out within the first year of trading. Controlling your emotions? and understanding trading psychology really will mean the difference between success and failure. Can you develop a discipline to follow your trading plan that you might not possess naturally? I think you can. Clearly discipline can be developed, and you only need to look at an army training program for confirmation of this. However, it is one thing to have a vast and experienced organization bearing down on you, prepared to do whatever it takes to make its point. It is quite another to do it yourself in the comfort of your own home, with all of the distractions of daily life. So what?s the secret to rock-solid, army-like discipline? One word: confidence. The discipline to follow your trading plan will come as you build your confidence through studying and applying the steps outlined in this book. To become a successful trader, you must always be learning and practising your decision-making skills, honing them until they become second nature.Only then can you react faster than a speeding bullet, and with unshakeable confidence. To figure out what?s going on in your head and to begin understanding your trading psychology, a great place to start is Brian McAboy?s The Subtle Trap of Trading or Trading in the Zone by Mark Douglas. Both of these texts will help you get your head in the game. 2.?? ?If you think you might need more help getting your head right, check out Anthony Robbins?s material, starting with Unleash the Power Within. Read “Subtle Trap Of Trading” and I’m half way through “Trading In The Zone”. All I have to say is AWESOME! Thank you so much for shedding light on the path to being a successful trader! Nice one Ray… I’m sure others (including myself) would love to hear any of the insights you have gained! Let me know. I lost about an apartments worth trading in Miami when the dot com bubble burst, like many I thought I knew what I was doing but learnt the hard way. But I am at it again now and have a fairly well developed plan trading US Penny stocks, expecially the biotechs. But I am still making the exact mistakes you mention, spreading out too much (too many trades at same time, too little foucus) and problem leaving losing trades while I try to stick to 20% rule. I would only disagree on the profit taking rules, do you not agree that one should take some of the profits off the table in a good trade and let the rest run, is there a rule there ? I personally like to let my profits run – I use my position sizing rules to limit my risk. That said, I have plenty of clients who, once they reach breakeven, remove their original investment and then just ride out their profits. There’s no hard and fast rule here… since you’re once bitten, twice shy, go with what makes most sense for you. To be blunt, I don’t think it’s realistic to expect to make $500 per week from a $2,000 float. That’d be a 25% return… weekly! Remember you’re only new to the game and even the best of us don’t get returns like that. Sure you might be lucky a couple of times but to consistently pull that type of return isn’t something I’d bet on. 1. Build up a larger trading float (at minimum $5,000). 2. Start with unleveraged instruments like stocks. 3. Prove you can make a 25% return for the year before trying to make 25% a week. Sorry to burst your bubble but I call it how I see it. David you are really great….what i have received from you is unexpressible. Hi David, I hope you don’t mind me using my web sites name as the name. I just wanted to share an experience as it relates to psychology. My parents won the lotto in 1998, it was half a million so it was not something to sneeze at. 4 years later they were bankrupt, and in more debt than at any other time in their lives. It was not easy to watch them go through this, but after they moved back into government housing and were on the dole, I decided to do some research, and I found that this phenomenon actually happens to 95% of all lottery winners. The thing is, anyone who has spent any time trading and reading articles, ebooks, forums etc, knows the statistics for traders who consistently lose is the same – 95%! In business, they say 80% of businesses fail in the first 5 years, and of those who succeed, 80% of those will fail in the next 5. If you do the math, this is the same statistic 95%! So, trading psychology is in most part, money psychology. We as a society, and it doesn’t matter what endeavour, be it trading, business (which is the same thing), saving, investing etc, are slaves to money and only 5% of us ever work out how to stop being a slave to it. So, my experiences tell me this is why I think a lot of trading psychology is money psychology in my view. For me, my point of trading turned when I stopped looking at the money! This is not to say to not use prudent money management, any system will break down once one starts using too high a % of trading capital per trade, but money is simply numbers in a trading business. Money is not something you spend until it is out of your trading account and into your pocket with the full intention of spending it. Big difference. among the advise you gave in this clip, I found this most interesting: “mastering, at the beginning, only one market”. To be sincere, I have always been tempted with asset allocation and diversification so, when I am in Metastock, I launch some explorations and have a response that, let’s say, 10 markets are interesting or, depending on the market moods, no markets (or only very few) are interesting. Selecting among them is difficult, but studying a plan for so many markets is often time consuming and risky, because, as you say, I don’t know none of them very well. So, should I only select 1 to 3 markets only at beginning? And, what do you mean, exactly, with the expression mastering or knowing a market? Don’t you think that it’s risky also to go only with a market? Why should we risk to lose what’ profitable in markets we are not trading? thank you. 1. Yes, select only 1-3 markets to start with. You really should just start with 1. 2. By focusing on 1 you will start to understand the way that market works… with clarity comes mastery. 4. Sorry you last question is not clear to me, are you able to re-phrase it. Dear David, with my last question I only intended that, as we all know, there is always something of interesting to trade in the world (when a stock goes up or sideways, another is rallying, when gold goes up, Stocks might be dipping…). I am worried about the fact that if we concentrate only on a few markets or stocks (or only one!!) we could lose occasions in other markets (for example, sometimes when some stocks are losing, other are giving “tempting” signals of strenght in my explorations). Do you think that we should ignore those signals if we don’t know the specific security or market? 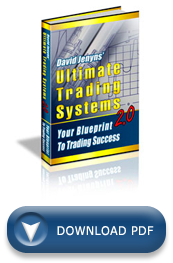 Hi David, from what I understand, I can develop a trading system purely based on trading rules 1. Cut your losses short and let your profits run 2. Size your positions appropriately(Do not overtrade) 3. Always follow the trend. It’s analogous to saying Cut your food intake and exercise regularly to a person who is overweight. As simple as that. Am I right? Thanks for your question… sadly, it’s not that easy – there’s a few more things you need have in place. That said, just by following the rules as you outlined above you’ll be ahead of the pack – most people don’t even have the basics in place. Can I suggest you continue through the freetradingsystems.org site and ensure you have something in place for each chapter… if you do, I know you’ll be giving yourself the best chance of success. Now all that is left is that you follow your system. Sounds like you’re on the right track, stick with it, you’re on the right track and the rewards are worth it. I’m a novice trader just started off and you’re totally right. It is really hard at first to cut losses. I’m started off small and hopefully I’ll be able to get myself in place. Looking at the professionals traders who trade with multiple system and multiple monitors making me wonders how does that actually helping them? I trade with one laptop. I will say that $67 is a great price for a self-study. I spent $400 for Van Tharp’s Home Study course, and he kind of strings you on by leaving parts of the puzzle missing. Then, you spend more to get the other pieces. Self study is difficult. One has to be totally honest with ones self. Since I am going through the Tharp course for a second time, I’m going to hold off on spending $67 for what is probably more of the same. Mindtraps is another book people may want to consider – but it is expensive. I am 57 yrs old and am looking at retirement. My goal in trading is to provide for our later years and leave enough for my wife so she can be independent. I’ve gone through several of the asset draining self-made traps, but I’m down only about 12% in my trading capital. I have a way to go in this venture of trading and expect that once I get further along in my learnings, I will be able to attain my goal. Thanks for being blunt and honest about this business. Blunt honesty is a truely rare quality among all those who purport to “train” students. Good luck in your own trading and I WILL eventually understand what I need to understand. Hi, this looks very interesting, as I have some experience trading stocks and options. I have ordered and started to read the ‘Subtle Trap of Trading’. I previously ordered “The Way to Trade: Discover Your Successful Trading Personality” by John Piper – because i watched a youtube video of you(perhaps it’s an older recording). I hope I am on the right track and on the right(most current) website. Thnx for the great material and presentation. Very professional.